For more analysis of the Quebec students' struggle, click HERE. May 22, 2012 -- Real News Network -- Today marked one of the largest protests ever to be recorded in Quebec's history. We are joined with Jérémie Bédard-Wien, who is a student organiser and who was on the ground today in Montreal. Jérémie, would you please describe for us what events have unfolded? For more coverage and analysis of the Quebec students' struggle, visit Life on the Left. May 19, 2012 – Links International Journal of Socialist Renewal -- The strike of post-secondary students in Quebec has taken a dramatic turn with the May 18 approval by the provincial government of a special law to cancel the school year at strike-bound institutions and outlaw protest activity deemed disruptive of institutions not participating in the strike. Details of Bill 78 were unveiled the day before and debated in a special, overnight session of Quebec’s National Assembly. They include a ban on demonstrations within 50 metres of a post-secondary institution and severe financial penalties on students or teachers and their organisations if they picket or otherwise protest in a manner declared “illegal”. Demonstrations of ten or more people must submit their intended route of march to police eight hours in advance. "Thomas Mulcair is a man of the establishment, not of the social movements." March 27, 2012 -- PolEcon.net, posted at Links International Journal of Socialist Renewal with the author's permission -- Canada's social-democratic New Democratic Party (NDP) has a new federal leader. Thomas Mulcair, has no roots in the social movements, a long history of being a senior Liberal Party member and is someone openly committed to pushing the NDP considerably to the right. The implications for all interested in progressive social change are sobering. Canada: The NDP -- new wine in an old jar? March 13, 2012 -- Life on the Left, posted at Links International Journal of Socialist Renewal with the author's permission -- Apologies to subscribers to this blog for my recent silence.A lot has happened recently, most notably the revival in the fortunes and prospects for the Quebec independence movement, which I will comment on before long. But the immediate item of note is the federal New Democratic Party [NDP, a social-democratic party similiar to the British, Australian and New Zealand Labour parties] leadership race, which will come to a close on March 24, 2012, at a convention in Toronto. There, the postal votes of the pan-Canadian membership will be tallied and the new leader will be selected by delegates, probably after more than one elimination ballot since it appears that none of the seven remaining candidates enjoys clear majority support. Amir Khadir, currently Québec solidaire's sole member of the Quebec legislature, the National Assembly. August 31, 2011 -- Life on the Left, posted at Links International Journal of Socialist Renewal with the author's permission and that of Alternate Routes -- The following article is scheduled for publication in a forthcoming issue of the journal Alternate Routes. It is an expanded and updated version of a presentation to the third annual conference of the Critical Social Research Collaborative, held March 5, 2011, at Carleton University, Ottawa, on the theme “Varieties of Socialism, Varieties of Approaches”. Part II (below) will discuss the evolution of Québec Solidaire since its founding. A number of attempts have been made in recent years to launch new parties and processes, addressing a broad left or popular constituency, that are programmatically anti-neoliberal if not anti-capitalist, some of them self-identifying as part of an international effort to create a “socialism of the 21st century”. They vary widely in origins, size, social composition and influence. New Democratic Party leader Jack Layton. May 8, 2011 -- Life on the Left -- If New Democratic Party leader Jack Layton’s election-night speech to his Toronto supporters is an indication of what lies ahead, the NDP is going to have a hard time coming to terms with a parliamentary caucus now composed of a majority of MPs from Quebec. To a crowded room in which nearly everyone was waving Canadian flags, the NDP leader delivered two-thirds of his remarks in English without ever mentioning the expression “Quebec nation”. The scene, televised across Canada, did not go unremarked in Quebec, where most of the NDP’s sudden support had come from nationalist-minded voters, including many sympathisers of Quebec independence. Françoise David, QS president, and Amir Khadir, its sole elected member of the National Assembly. April 7, 2011 – Links International Journal of Socialist Renewal – At a convention held here March 25-27, 2011, Québec solidaire (QS) concluded the second round in the process of adopting its program. More than 350 delegates from party associations across the province debated and adopted the party’s stance on issues in relation to the economy, ecology and labour. And they reaffirmed their determination to build the party as an independent political alternative, rejecting proposals by QS leaders to seek “tactical agreements” with the capitalist Parti québécois (PQ) and/or the Parti vert (Greens) that would have allowed reciprocal support of the other party’s candidate in selected ridings. March 30, 2010 -- Life on the Left -- A five-year long attempt to reform the Parti Québécois (PQ) as an independentist and “social-democratic” party ended abruptly on March 13 when the PQ’s national executive decided not to renew recognition of its left-wing “political club” as an authorised grouping with the party. The decision, which effectively expelled Syndicalistes et Progressistes pour un Québec Libre (SPQ Libre) from the party, was promptly approved by the PQ’s conference of constituency presidents. Québec solidaire's member of the Québec National Assembly, Amir Khadir, tossing a shoe at a picture of US President George Bush at a rally in Montreal in November 2008. December 3, 2009	-- Socialist Voice -- Québec solidaire, the left-wing party founded almost four years ago, held its fifth convention in the Montréal suburb of Laval on November 20-22, 2009. About 300 elected delegates debated and adopted resolutions on the Quebec national question, electoral reform, immigration policy and secularism. The convention clarified the party’s position on some important questions at the heart of its strategic orientation that had been left unresolved at its founding. 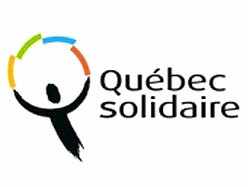 Québec solidaire is the product of a fusion process lasting several years among various organisations and left-wing groups that had developed in the context of major actions by the women’s, student, global justice and antiwar movements in the 1990s and the early years of this decade. But the party has faced many obstacles as it struggled to establish a visible presence in Quebec’s political landscape. November 9, 2009 -- The October 22 ruling by the Supreme Court of Canada overturning yet another section of Quebec’s Charter of the French Language (CFL) has been met with angry protests by a broad range of opinion in the French-speaking province. The court declared unconstitutional a law adopted unanimously by Quebec’s National Assembly in 2002 that closed a loophole in the charter being used to circumvent the requirement that Quebec students attend French-language schools. In effect, the judgment restores free choice of language of elementary schooling for parents rich enough to send their kids for a few years to private schools not funded by the Quebec government before enrolling them in English public schools. A Québécois militant, member of Québec solidaire, discusses the global implications of the strike by 3500 workers at Vale Inco, the world’s largest nickel mine, in Sudbury, Ontario. Québec solidaire's Amir Khadir (left) has been elected to the Québec National Assembly. December 15, 2008 -- In the December 8 Québec general election, the Liberal government headed by Jean Charest was re-elected with 66 seats, turning its minority status before the election into a thin majority of seats in the National Assembly. The sovereigntist Parti québécois (PQ), benefiting from a late surge in the polls, was elected in 51 seats and replaced the right-wing Action Démocratique du Québec (ADQ) as official parliamentary opposition. The ADQ elected only seven members.